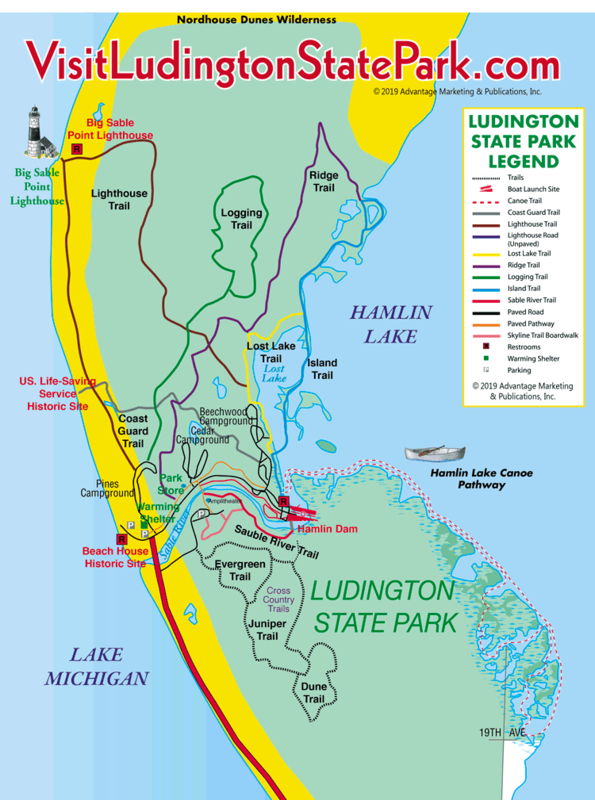 the Ludington State Park Trail Map here. The numerous trails that wind their way through the Ludington State Park are as varied as they are beautiful. A description of each trail follows, giving visitors a choice--from a short 30-minute hike to a more leisurely three-hour walk. The trails offer historical facts and bring the natural beauty of the park in full view. The walking times listed are approximate, and depend upon your fitness level and preferred pace. 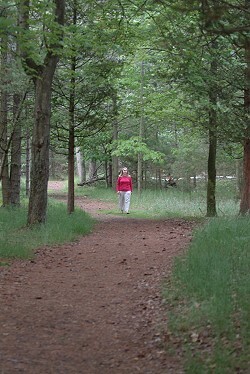 Be sure to enjoy as many Ludington State Park trails as possible, as the beauty of each trail is totally unique! The miles listed below are for the complete loop, or round trip. 1.5 miles long, 1 hour walking time -- This trail winds through the wooded dunes from the Lake Michigan beach to the Beechwood Campground and links all three campgrounds together. On your hike, you'll see the historic site of one of the earliest life-saving stations on Lake Michigan. Also featured are marshes, wildlife living in and near them, and acres of forest blown down due to storms. 3 miles long, 2 hours walking time -- The Lighthouse Trail winds over and through open and wooded sand dunes. At one end is the Beechwood Campground and at the other end is the Big Sable Point Lighthouse. The lighthouse is open daily May through October for visitors to tour and climb the tower. The trail's natural features are the drastically different environments found within the sand dunes, which give you a sense of being small among the rolling dunes. The Lighthouse Road, which travels from the main entrance parking lot up to Big Sable Point Lighthouse, is a 1.8 mile trek through hard packed sand and occasional gravel. At a good pace, you can walk it in 40 minutes, and there are benches along the way. 3 miles long, 2.5 hours walking time -- The Logging Trail meanders through the wooded sand dune valleys, giving you plenty of shade on a hot summer day. This historic trail loops around, beginning and ending at the north end of the Pines Campground. The trail continues through a deciduous forest that has replaced the white pine forest, cut down over 150 years ago. The two trail shelters were built in the 1930s by the Civilian Conservation Corp Camp that was located where the Hamlin Beach is today. In the winter, this trail is a popular groomed cross country ski trail. 4 miles, 3 hours walking time -- The Ridge Trail and Island Trail make an ideal hiking loop for a diverse view of nature. The Ridge Trail begins off the paved walkway, just east of the Park Office. The Island Trail begins at the Hamlin Lake boat rental area. Both trails come together to complete a loop about two miles out. The Ridge Trail follows the top of a tall wooded sand dune, stretching for miles. Vistas are numerous and inspiring. The Island Trail follows the beautiful sandy shoreline of Hamlin Lake. All kinds of aquatic creatures and birds are seen along this shoreline. Take a picnic, because there is a lovely historic shelter overlooking the vast open sand dunes and Hamlin Lake. 1 mile, 30 minutes walking time -- The Sable River Trail has been improved over the last few years to accommodate people in wheelchairs who wish to access the Hamlin Dam and Big Sable River. This is a relaxing walk on the dam and along the river boardwalks and paved pathway. Interpretive panels along the walk point out important historic sites and changes over the last 200 years. Fishing is very good near the dam and on the river, especially when the fall salmon run begins. In the winter, the river and dam area comes alive with migratory waterfowl and playful river otters. If you're lucky, you may see a Bald Eagle swoop down to pluck a fish from the river. 1.5 miles, 1 hour walking time -- The Lost Lake Trail circles a little watery cove off Hamlin Lake. The trail loops around, beginning and ending near the Hamlin Lake Beach House. The east side of this trail shares itself with the Island Trail and snakes through a series of small islands connected by foot bridges. 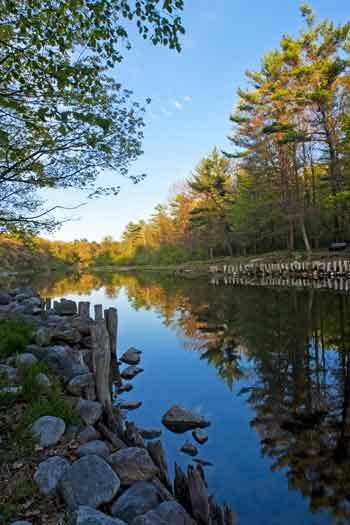 The north end of the trail winds through a wooded sand dune ridge overlooking a picturesque Lost Lake. The east side of the trail follows the shoreline, exposing the natural animals and plants living near the shore. 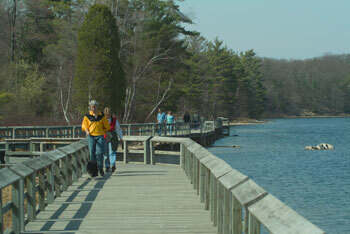 An extensive boardwalk extends over the lake near the Beechwood Campground, giving hikers a unique feeling of being out on the water. Deer, muskrats, river otters, large waterfowl, turtles and song birds populate this area and are easily viewed. .5 mile, 30 minutes walking time -- The Skyline Trail runs along a tall sand dune ridge, on the south side of the river between the footbridge and Hamlin Dam. The trail begins at the west end of the parking lot and exits onto the Sable River Trail. This trail is completely elevated, made even higher by an extensive wooden boardwalk system. Several vistas let you look out over miles of sand dunes and Lake Michigan. On a clear day, you can see 20 miles to the Silver Lake State Park Sand Dunes. On the back side is an area where you can leave the boardwalk and run up and down the steep slope of this sand dune. 6 miles, 3 hours walking time -- The Ski Trails of the south end of the park are actually three looped trails tied together. The South End Ski Trails start from the west stairway of the Skyline Trail. The trails weave through the sand dune valleys of thick jack pines and wetlands. The protection from the blistering winter winds in these valleys provides a perfect venue for cross country skiers. In the summertime, extreme dry, hot temperatures require hikers to take plenty of water and sun block. Wildlife thrives in these valleys, using the wetlands and shrubby pines for shelter and food. 2-4 hours, depending on skill level -- The Canoe Pathway begins and ends at the Hamlin Lake Watercraft Rental/Dune Grass Concessions area near the swimming beach. From there, you cross the river and head into Hamlin Lake. As you travel close to the south shore, you'll enjoy a variety of landscapes, from swampy area filled with reeds and cattails, to the "Carp Ponds", named for the many carp that spawn there in the spring. Within the marshlands along the trail is an excellent habitat for duck, geese, herons and others. Near the beginning of the trail you'll encounter two large, sandy hills, known as Desperation Point. Local sailors gave it this name because of the unpredictable shifting winds found there. The trail is not demanding for a canoeist with minimal experience, but care should be taken to avoid various submerged tree stumps. Ask about guided canoe trips, where a Michigan DNR interpretive specialist explains the flora, fauna, and history of the area.